its looks, easy installation and data cabling capacity. A high-profile £multi-million pound construction project has put Marshall-Tufflex’s Sterling Profile 4 multi-compartment PVC-U cable management system to good use in a large number of offices and support buildings. Marshall-Tufflex is one of the preferred cable management suppliers for the UK project and Sterling Profile was selected for its data cabling capacity, aesthetics and ease of installation. The project required a system which met Cat 6a cabling requirements (Sterling Profile 4 meets Cat 7a) as well as those of the Disability Discrimination Act for people with visual impairment, Approved Document Part M and IP4X. 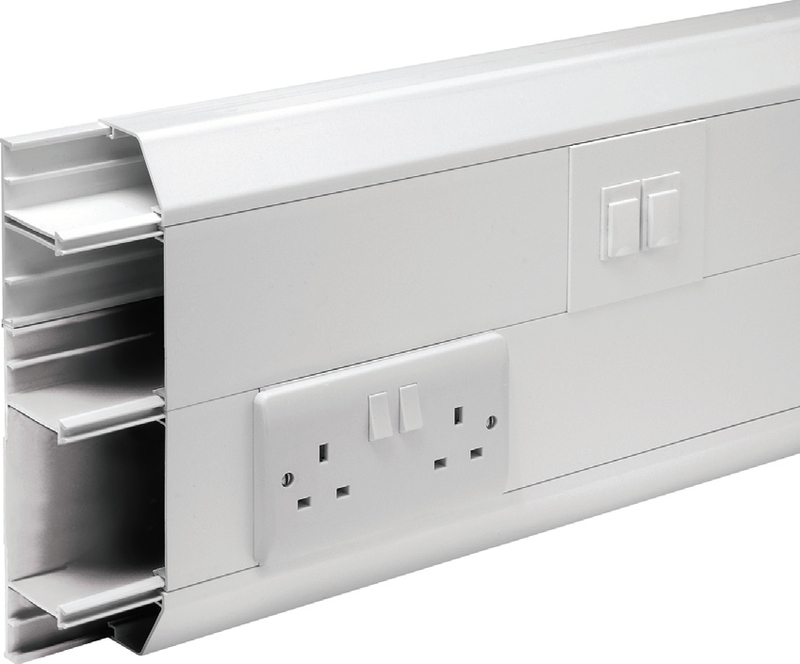 Sterling Profile 4 is designed for perimeter dado and skirting installations, offering one half size and two full compartments with the option of extending the height if required. It is available in a variety of colours/finishes and the range includes flush power and data accessories, corners, flat angles, bends and tees. The system can accommodate wiring alterations and additions while further services segregation within each compartment can be achieved through use of dividing fillets. The trunking solution is just one of a large range of PVC-U cabling systems designed and manufactured by East Sussex company Marshall-Tufflex, which leads the cable management field in product quality, choice and eco credentials; overall its PVC-U cabling systems are comprised of approximately 80% recycled material, all high grade plastics sourced from the window fabrication industry. This raw material is REACH compliant, stronger and more robust than virgin extrusion-grade PVC-U and allows the company to prevent the equivalent in weight of 300 double decker buses of PVC-U going to landfill each year.